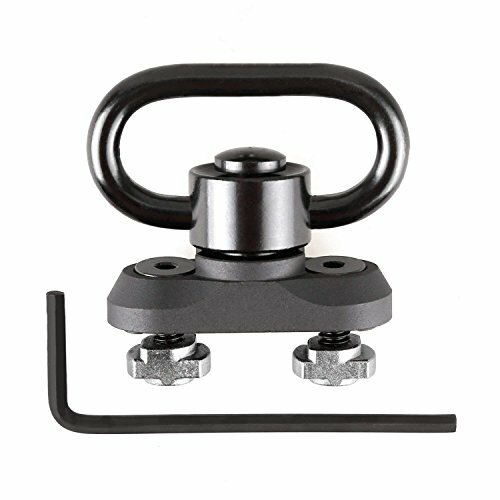 M-lok(r) standard qd sling swivel adaptor, accepts standard push button sling swive, precision machined base for one slot, low profile, lightweight, anti-rotational stop design, matte black hard anodized, aircraft grade aluminum. Packaging list: 1 x qd sling swivel 1 x m-lok(r) swivel mount 2 x m-lok(r) screws 2 x m-lok(r) t-nuts 1 x allen wrench. If you have any questions about this product by TACwolf, contact us by completing and submitting the form below. If you are looking for a specif part number, please include it with your message.